Misconception #1. Freestyle “catch-up stroke” is a viable technique. Research shows that catch-up stroke is biomechanically ineffective, physiologically inefficient, anatomically stressful, and counterproductive from a skill-learning perspective. Biomechanically, catch-up stroke produces an ineffective arm synchronization, where no force is generated by either arm on two phases of each stroke cycle. Physiologically, there is an inefficient use of energy as the body velocity fluctuates. (The energy cost of speeding up on every stroke is greater than maintaining a relatively constant velocity.) Anatomically, when the arm is held in position in front of the body and parallel to the surface, the angle at the shoulder reduces the space for the soft tissue between the upper arm and shoulder. This position causes irritation and decreased blood flow and is classically related to shoulder impingement. (Torso rotation with this arm position further stresses the shoulder.) And from a skill-learning perspective, research shows that swimmers don’t use catch-up stroke when swimming fast, so why reinforce a technique that you’re not going to use for racing? Misconception #2. In freestyle, hip rotation increases hand force. In freestyle, the torso rotates about the polar axis (a reference axis through the center of the body from head to feet). The concept of “summation of forces” requires that successive body segments (e.g. torso, upper arm, lower arm, hand) rotate in the same direction (as in throwing). The freestyle arm motion is perpendicular to the torso rotation and the hand force cannot be increased by the force of hip rotation. Although the timing of the push phase in freestyle is usually simultaneous with torso rotation, rotating the hips harder or faster will not increase hand force. Exaggerated torso rotation can even produce counterproductive motions. For example, forceful torso rotation synchronized with the push phase can result in hand motion that is more upward and sideward than backward, producing a sudden decrease in hand force. Misconception #3. In freestyle, the hand path is S-shaped. The path of the hand depends on whether it is “typical” or “optimal,” and also whether it is described with respect to the water or the body. For example, the typical hand path with respect to the water is often s-shaped. However, the optimal hand path with respect to the body is better described as a gradual “zig-zag.” Since a swimmer can only track the hand path with respect to the body, it is better to think of the path as more straight than s-shaped. An optimal path results from moving the hand at a gradual angle from in front of the shoulder to beneath the head, and then to change direction and angle the hand from under the head to beneath the thigh. Misconception #4. In butterfly, the arm motion is circular or hourglass shaped. Similar to freestyle (misconception #3), the shape of the hand path depends on whether it is “typical” or “optimal” and whether it is with respect to the water or the body. A typical hand path with respect to the water often has a wide hourglass shape that is almost circular. An optimal hand path with respect to the body has a very narrow hourglass shape. Swimmers usually need to feel like they are pushing their hands straight back to achieve the optimal hand path. Misconception #5. In freestyle, submerge the head to bring the feet to the surface. One of the many misconceptions about swimming technique is that the head must be submerged for the legs to stay behind the shoulders and minimize resistance. Although lowering the head may help to raise the legs, breathing then requires excessive head motion that distorts the body and increases the cross-section (and also increases resistance). Arching the lower back lifts the legs to bring the heels to the surface. If the legs stay behind the torso, resistance is minimal. The smaller the swimmer maintains the area of the body perpendicular to the direction of motion (the body cross-section), the lower the resistance. Misconception #6. Butterfly and breaststroke are “short axis” strokes. Misconception #7. The forearm is vertical at the beginning of the freestyle pull. If the elbow is flexed and the forearm is vertical, the hand must be lateral (to the outside of) the shoulder. As force is applied during this motion, torque is generated and the body twists about the antero-posterior (front to back) axis. 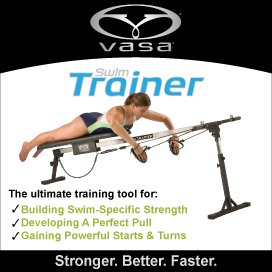 The twisting motion increases resistance and slows swimming velocity. In addition, the arm is weakly positioned for the push phase. It is more effective to diagonally orient the forearm during the pull phase, so that the hand moves from in front of the shoulder to a point beneath the head. The swimmer will benefit from improved leverage and have the arm in a stronger position to generate force on the push phase. Misconception #8. The freestyle body roll enables the arm to reach deeper in the water. Torso rotation (or body roll) in freestyle serves two main purposes: 1) to make it easier to recover one arm with less shoulder stress and 2) to put the other arm in a stronger position to generate force with the hand close to the center line of the body. Most swimmers enter the arm with a shallow angle so that the arm is near the surface at the completion of the entry. With a typical shallow entry, torso rotation will not necessarily enable the swimmer to “reach deeper in the water.” However, entering the arm with a downward angle synchronizes well with torso rotation and quickly achieves a strong position to begin the pull. Misconception #9. The backstroke body roll allows the arm a longer time in the water. Torso rotation (or body roll) in backstroke serves the main purpose of making it easier to bend the elbow and orient the arm in a stronger position to generate force along a path that is closer to the body. When the arm is in a stronger position, it can move at a faster speed so that it is in the water for a shorter time, and increase the stroke rate. In breaststroke, vertical motion of the body is inversely related to stroke effectiveness. A more vertical body position means a greater body cross-section and more resistance. A swimmer can benefit from an upward dolphin action of the legs without vertical body motion. Misconception #11. In butterfly, the kick begins with the hips. The kick begins with the upper legs, not the hips. The fly downbeat begins with downward motion of the upper legs, immediately followed by the lower legs and feet. Upward motion of the hips is a reaction to the downbeat of the feet. Misconception #12. In butterfly, body undulation is critical to success. Think of the dolphin undulation as a reaction instead of an action. See misconception #11. Misconception #14. In freestyle, the most force is generated at the beginning of the stroke. Force analysis clearly shows that swimmers generate more force on the push phase (i.e. after the arm passes the shoulders) than the pull phase. There are two primary reasons for greater force on the push phase: 1) the arm is in a position with better leverage and 2) the hand is already moving and has already achieved substantial speed. At the beginning of the stroke, the arm has very poor leverage and has not yet begun to move backward, so a great amount of muscular force is necessary to apply even a minimal amount of force on the water. A swimmer could very well be exerting more muscular effort at the beginning of the stroke, but will undoubtedly be generating less applied force.